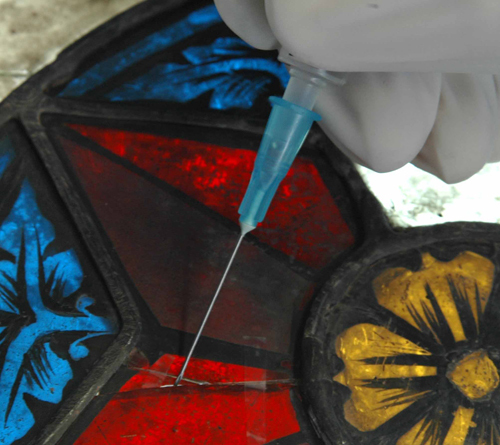 In order to properly adhere fine cracks, the preparation of the adhesion points is enormously important. The mere confidence in the capillary effect of the adhesives is simply insufficient - especially when treating older cracks. Exact orientation of the glass edges balanced to each other and along the original run of the glass painting, to avoid interruptions and shifting. Selection of the proper adhesive. UV adhesives or similar, intensely-hardening adhesives are not suitable for this use, since when a load is applied, the piece of glass usually breaks near the adhesion point. In such a case, however, the adhesion should better re-open instead of re-damaging the original material. Good aging resistance and breakage index, along with low yellowing tendency, are additional criteria. Careful infiltration of suitable conservations adhesive to the cracks. Due to the capillary effect, the adhesive agent is distributed optimally in the crack. Careful re-cleaning of the adhesion point, so that no adhesive residue remains on the surface (this can cause over time the formation of dirt or micro-organisms. If necessary, retouching of the crack's edges to complete the run of the contour lines. One can also work with stained adhesives. Re-installation of the adhered piece of glass to the lead-netting bond. Painstaking handiwork and fine-tuned tools are essential to the adhesion of cracks.